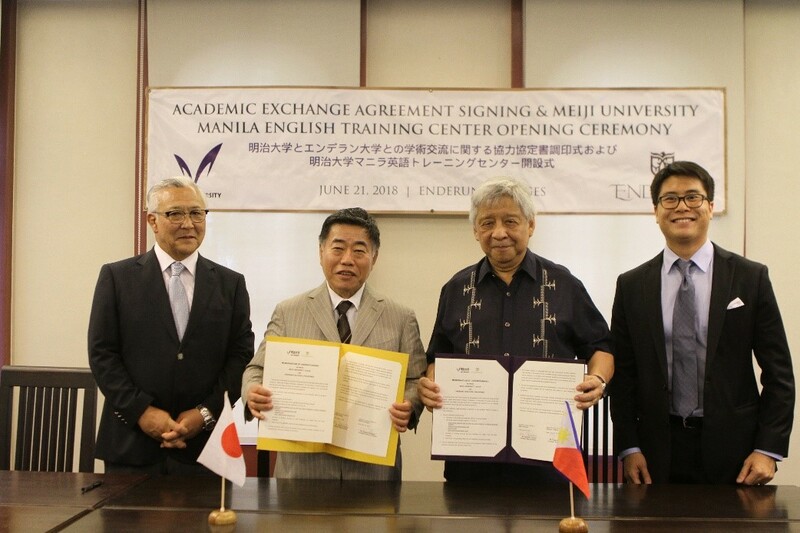 Enderun Colleges officially became Meiji University’s English training center in the Philippines on June 21, 2018. Enderun Colleges President Edgardo Rodriguez and Meiji University President Keiichirou Tsuchiya signed a Memorandum of Understanding with the purpose of promoting the development of the relationship through collaboration in programs, exchange of information and materials of mutual interest, exchange of students and other forms of cooperation that the two educational institutions may jointly arrange. “We are happy to partner with one of the top universities in Japan. We believe that this partnership and the programs and projects that we will create will be very beneficial for the students of both schools,” Enderun Colleges President Edgardo Rodriguez shares. Meiji University was founded in January 1881 and ranks solidly among the best universities in Japan. It currently consists of 10 schools: the School of Law, School of Commerce, School of Political Science and Economics, School of Business Administration, School of Arts and Letters, School of Information and Communication, School of Global Japanese Studies, School of Science and Technology, School of Agriculture, and the School of Interdisciplinary Mathematical Sciences.